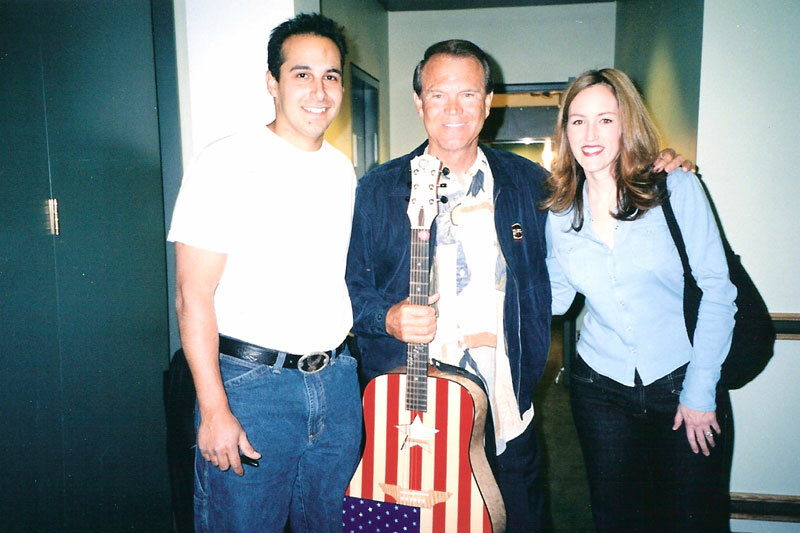 LOS ANGELES,–(HISPANIC PR WIRE – BUSINESS WIRE)–September 4, 2002–Manuel A. Delgado, who began crafting a guitar to help victims of the terrorist attacks of September 11, is among this year’s recipients of the Local Hero of the Year Award from Union Bank of California, N.A. in partnership with Public Broadcasting Station affiliates in Los Angeles, San Diego and Fresno. Shortly after the East Coast tragedies, Manuel Delgado gave blood, donated money and prayed for the victims of the terrorist attacks but he didn’t think he was doing enough to help. So, he put his talent to work and began doing what he does best, hand-crafting the Unity Guitar. Manuel made the guitar to have it signed by top entertainers with the purpose of auctioning it and donating the proceeds to victims of the terrorist attacks on the first anniversary. 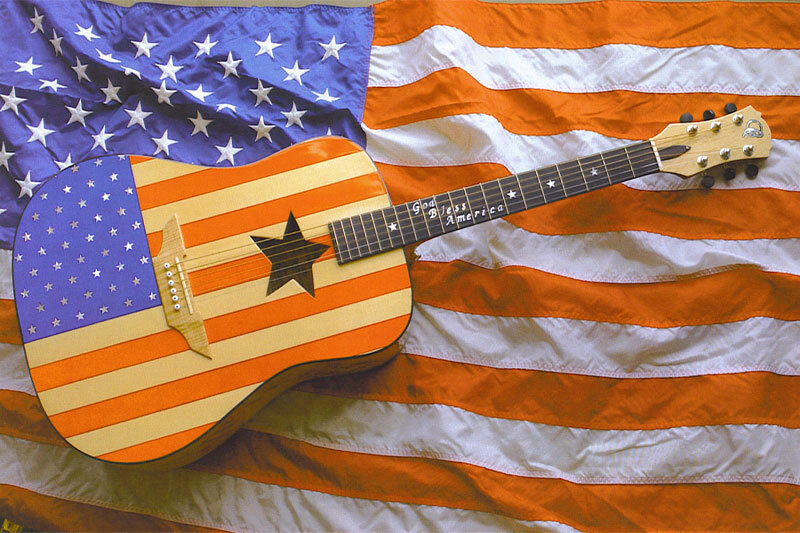 An Eastside man hopes stars will strum the instrument he created with a patriotic theme to be auctioned off for the benefit of attack victims. 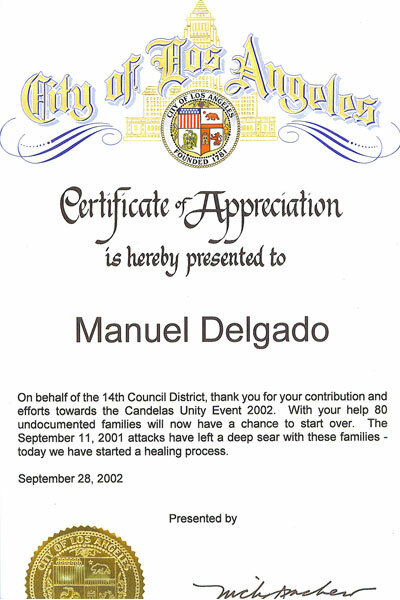 Manuel Delgado gave blood. He donated money and prayed for the victims of the terrorist attacks. But he still searched for a more personal gesture to make. 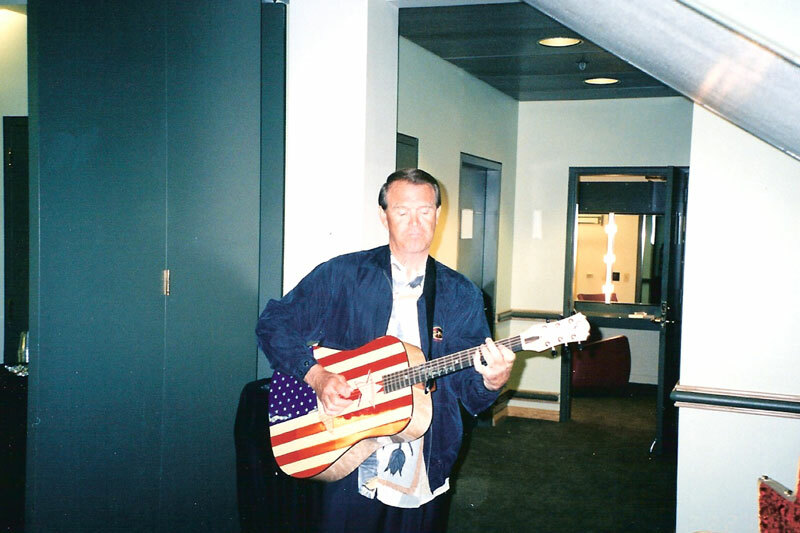 He decided to do what he does best: He made a guitar, one with the Stars and Stripes on its front. But as he labored making the instrument by hand at his family’s guitar shop in East Los Angeles, he wanted it to serve a meaningful purpose. The finished guitar, with its glittering mother-of-pearl stars, now rests in a case in the corner of the shop, waiting to fulfill his plans. Manuel, whose family’s Candelas Guitars has crafted instruments by hand on the Eastside since the 1940’s, hopes to persuade various big-time entertainers to play the guitar over the next few months. Then, on the anniversary of the attacks, he wants to auction off the instrument in New York City and donate the proceeds to victims. It’s an ambitious project, he knows. But, driven by faith, he believes it will become a reality. Candelas Guitars is well-known in some circles of entertainers and, over the decades, the shop that has made instruments for some famous musicians – particularly Latinos. The shop is now run by Manuel, 30, and his brother, Tomas, 32 – the third generation of guitar makers in their family. But the business can be traced to the 1920s when Manuel and Tomas’ grandfather, Porfirio, and great-uncle Candelario, started it in Mexico. 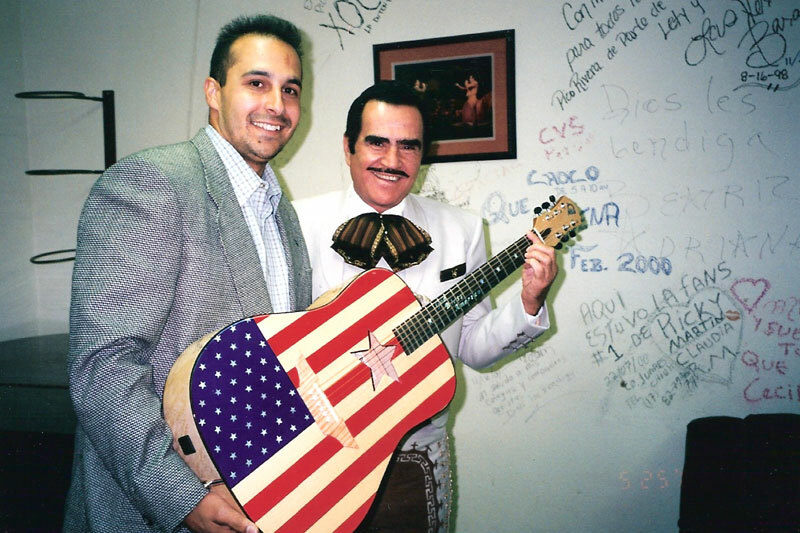 In the 1940s, they moved the shop to Los Angeles where Porfirio’s son, Candelario, who was Tomas and Manuel’s father, became the second generation of guitar makers. The younger Candelario died of cancer in 1994 at 52; Tomas and Manuel have since operated the shop on Cesar Chavez Avenue, two doors up from where it opened. On Sept. 11, the brothers were getting ready to come to work at the shop when they awoke to the TV images of the attacks. In the aftermath, they went through the same emotions that many people across the country experienced. Manuel gathered with the congregation at his San Dimas church. As the names of victims became known, each member of the church drew a piece of paper and prayed for the name on it. Manuel’s read: Christine Hanson, 3 years old, Groton, Mass. She was on United Airlines Flight 175 from Boston to Los Angeles. “I still pray for her,” he says. He still carries the piece of paper in his wallet. He prayed for personal guidance too. “God, what do I do? How can I help?” he remembers asking. Driving to work one morning, he realized he should use his God-given talent of making guitars to help the victims. He ran the idea by Tomas, who, as the owner of the shop, gave him permission to work on the special guitar. Over the next three months, they ran ideas for the design by each other. Manuel printed out an American flag from the Internet to use as a model. He decided to use mother-of-pearl to inlay “God Bless America” and the stars. At first, he wanted to use woods only from America to show patriotism. But then, as a symbol of world unity, he opted for the woods from around the world that are typically used at the shop. There was Canadian spruce for the front, American maple for the back, Indian rosewood for the binding, Honduran mahogany for the neck and African ebony for the fingerboard. He wanted to get others involved, so he explained his project to representatives of some companies that make guitar parts. They like the idea and donated tuning pegs, a pickup, a case and the mother-of-pearl. Now that the guitar is done, Manuel faces the hardest part of the project: getting famous musicians to play it. He can call longtime friends of the shop, such as Los Lobos. 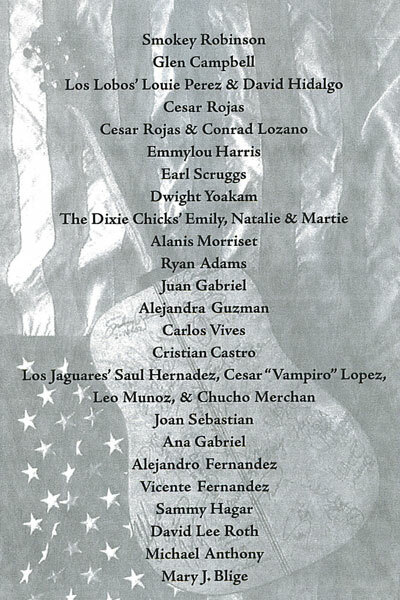 The band’s drummer, Louie Perez, has been helping Manuel with the project. But he doesn’t exactly have the number for Garth Brooks, Manuel jokes. A few weeks ago, a well-known mainstream rock star came from Santa Monica to the shop to pick up an instrument he had ordered. Over a bite across the street, Manuel tried to explain his project and shyly asked the star if he would be interested in playing the guitar during a performance. But the guitar hadn’t been completed. They singer listened and didn’t say no. But Manuel didn’t want to seem opportunistic so he didn’t push it. He’s hoping the singer eventually will play it. A few doors have opened. He’s to have a meeting with someone at Universal Amphitheatre. A public relations agency has also agreed to help pro bono. The idea is to get all kinds of stars – Latin, mainstream American, singers, musicians or other celebrities – to play one song during a performance or to simply hold the guitar. 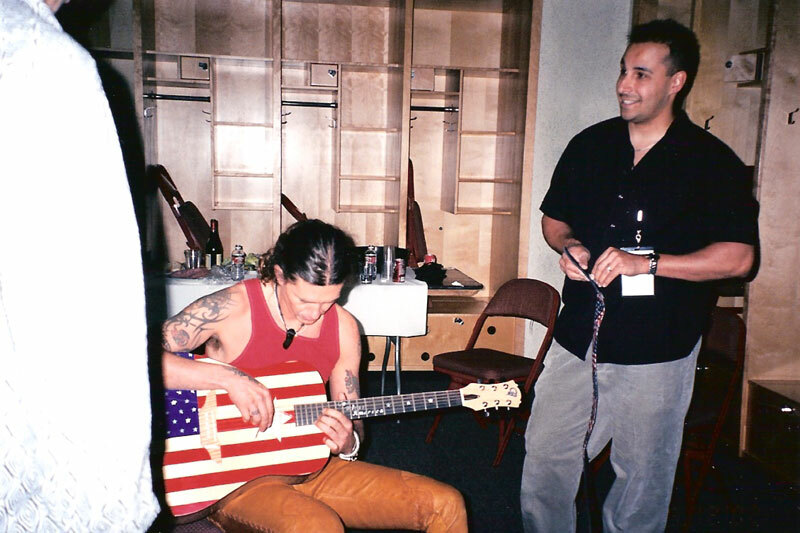 Out of respect for the flag, he doesn’t want the front of the guitar to be signed. But singing the back would be OK.
Maybe he can take pictures of the stars playing the guitar and the photos can be given to the person who finally buys the instrument. The guitar, with its full sound that fills a small room, is typical of the guitars the shop often tailors for clients. The brothers would normally sell a steel-string guitar like it for $3,000 and up. But Manuel says that, if he succeeds in getting stars to play it, the sky is the limit. All the money would go to victims – maybe to some of those Manuel says, who have not gotten as much help as others. He believes the project will happen, Manuel says. But already, he draws satisfaction from using his guitar-making talent wisely.